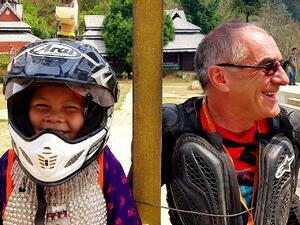 Contact Joerg About the Northern Thailand Experience! 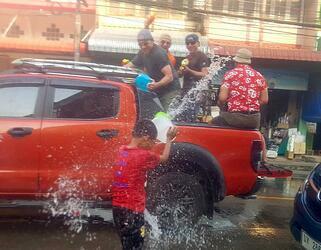 April Trips: "Songkran," or the Thai New Year celebration, a non-stop water fight you'll never forget! The opportunity to ride amongst and interact with some of the kindest, friendliest, smiling people in the world ... in Thailand! Riding Skill Required: Ability to deal with changing surfaces including pavement, dirt, sand, gravel, mud, and possibly hot weather depending on the month chosen. None of the route will be single-track type trails, so the rental motorcycles we offer for this trip are perfectly appropriate. 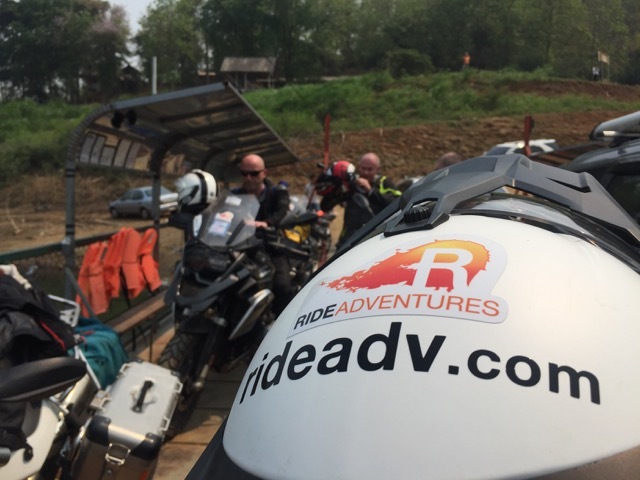 Riders are encouraged to consult with us thoroughly to determine their readiness for such an adventure ride, as you will not want to miss any of it. *Please note that we have 6-bike minimum group size to run this trip as a Guided Group tour at the pricing/inclusions shown. Trips may continue with fewer than 6-bikes, although changes in pricing/inclusions may be necessary. *Please note that we have a 6-bike minimum in order to run this tour package at the pricing/inclusions shown. Trip may continue with fewer than 6 Riders, although changes in pricing/inclusions may be necessary. Please note that Self-Guided packages include your motorcycle rental, hotel package, breakfasts, and Road Book or GPS to be your guide. Self-Guided packages do not include things like a Lead Motorcycle Guide, Support Truck, Fuel, Hotel Transfers, or any meals other than breakfast included in the hotels. Inquire about specific dates for a formal Quote. "My dad and I had the best time of our lives! Diederik and Edi were excellent, really help made it a great tour. - If anyone would like to contact me to ask questions about the or tour around Peru, please feel free to pass them my email and Cc; yourself." -Alexandra Carroll from Australia, having given us exactly what we're after in this business: Great feedback about motorcycle trips! Alexandra and her father joined one of our "7 Highlights of Southern Peru" tours in early 2015. "Javier was a great guide and a very fun and good person. We are making a movie of the trip (Javier was the main cameras man) and will share that with you. Here are a couple of photos from the trip. Thank you very much for an incredible journey in a wonderful country. Next year we are off to Russia for our annual cruise. We had an AWESOME trip. A big special thanks to Javier...he was extremely special." 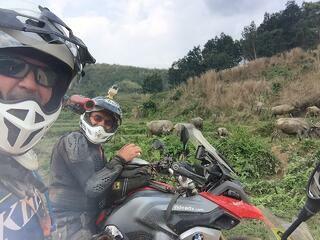 -Charles Davidson, Brandon Batagol, and Bruce Syme from Australia after their private motorcycle tour of Peru. Glad you guys enjoyed so much, let's do those "hot springs" tours! "Fantastic tour on the Machu Picchu Express. Good route with a mix of desert, mountains and rainforest. Some excellent riding and a good crew. Top marks to Geert and eddy who kept us entertained in the evenings and informed during the tour plus on the road whatever the problems that came up." "It was a fantastic ride. Much more than we expected. It was also much more demanding that I expected. The BMW 800 was an excelent choice and we loved the bike we were given. Plan on long ride days. 350 kms don't seem like much, but with rain, hail and fog it took almost 9 hours to complete that leg. It was major fun thou. The people at ADV are great. Met Eduardo and he was VERY helpful with all posible details. The only drawback was the darn GPS. But Then again I always had problems with the Zumo units. A minor glitch in an otherwise fantastic adventure. Don't miss Peru. You'll love it." -Gustavo Priyoltensky from Massachusetts after what was clearly a great self-guided motorcycle trip in Peru with his father in early 2015. Come back again, guys! "Guys had a great time, despite Phil almost being arrested LOL. He left his ID and money etc. under a mattress at one of the hotels a maid found it and turned it in but not before they were stopped at a checkpoint along the route. Phil had no idea he had forgotten it. Your staff was wonderful in assisting them. Phil took like 1600 photo’s. Next time they want another motorcycle trip, I will definitely keep you guys in mind. Thank you so much for all your assistance." -Written by Brandi who assisted in setting up a self-guided Peru motorcycle trip package for the Nelson brothers from the U.S. Worth noting here is that, while we don't recommend leaving things behind in hotels, there are definitely good people all over the world, including beautiful Peru! A trip best described as a "non-stop fun reel!" 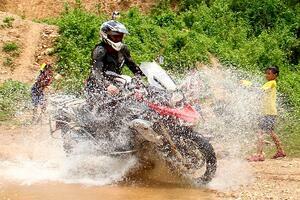 Designed to show Riders the absolute highlights of Northern Thailand with the most reasonable and minimal trip duration possible, the 13-day itinerary listed below is available as both a Self-Guided and Guided Group tour package. The same itinerary in either format, it's an experience that will have everyone beaming smiles from within their helmets, and wondering "how have I never done this before?" The historical Old City of Chiang Mai serves as both the start & finish of this adventure ride, putting the ends on a string of highlights like no other. Through a constant ribbon of valley and mountain riding, along the Mekong River and back up through the infamous Golden Triangle with countless smiles from the beautiful Thai people, this is it. The very best you can do in such a trip duration. 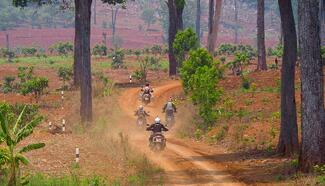 From the tiniest dirt road villages to the majestic Buddhist temples, there are so many experiences Riders will enjoy. 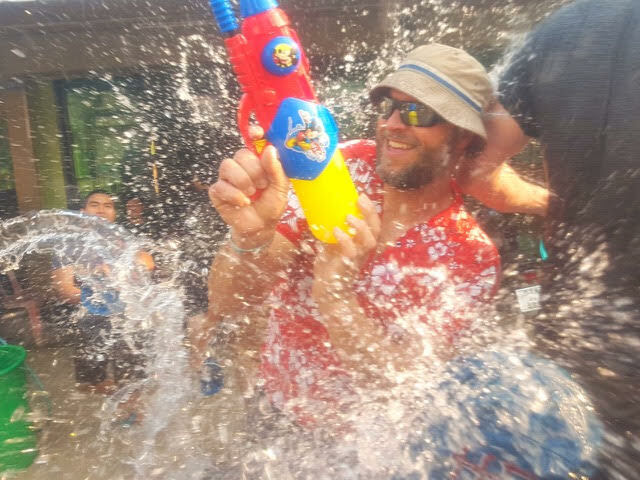 Those of you coming in April get to experience Songkran, the New Year celebration and non-stop, nationwide water fight with the fun local people. 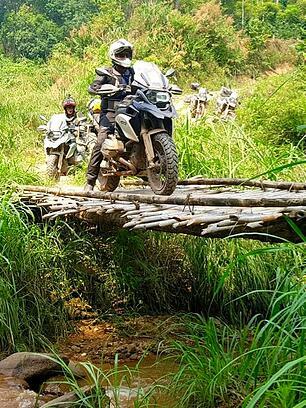 Year-round, the food is incredible, the people of Thailand welcome adventure bike riders with beautiful smiles, and you'll be surprised like we have been about just how great the twisty, switch-backed riding in Thailand is! Contact us for more tour information. Day 1 – Welcome to Thailand! This beautiful country, rich with history and full of friendly, smiling faces awaits you for what will undoubtedly be a motorcycle trip that you’ll never forget. A simple 15 minute transfer to your hotel in the Old City of Chiang Mai will remind everyone just how motorcycle-friendly this country is, and that you’ll definitely be piloting a much “larger than average” bike throughout the region. Get settled in, and our staff will explain the rest about check-in, bike papers, and such. The much-anticipated riding begins! 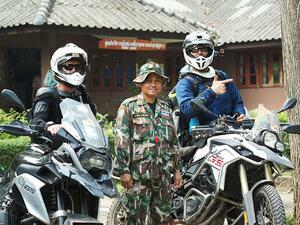 But only after a proper fitting and familiarization with the motorcycle reserved for your adventure. Leaving Chiang Mai and headed southwest, don’t worry if a 2nd cup of coffee is needed as part of your daily routine, as even in the countryside, you’ll see just how much the Thai people LOVE having coffee regularly available. With a bit of off-pavement riding en route to the Vachiratharn Waterfall and a climb to the top of Doi Inthanon (highest peak in Thailand at 2,565m) the entire route is designed to be as “rural” as possible without missing some major city attractions. Twisting and turning your way to Mae Sariang along the Yuam River near the Myanmar border, enjoy a relaxing look back on your first day’s RIDE, and more great riding ahead! Heading toward a gateway city to Myanmar, the smallest backroads we know of will bring site to the biggest smiles we know of. Small villages, friendly people, and a simple way of life will remain somewhat of a “theme” for the rest of this trip, so settle in for some “travel nirvana,” all by the twist of your wrist. Have you noticed how good the food is here yet? Riding near the Friendship Bridge connecting Myanmar and Thailand, it’s possible to walk across to the local markets (if time allows.) Then eastbound through the countryside, long sweeping turns along Route 12 give way to more of an urban setting, and the UNESCO World Heritage Site and Heritage Park that Sukhothai is partly famous for. A sunset stroll through the park gives great photo opportunities for the 26 Buddhist temples that remain with stories of the “whispering Buddha” taking our minds away from the modern world. Relax for an evening in excellent accommodations, and ready yourself for more great riding ahead. A traditional Thai breakfast paves the way for more great coffee stops nestled amongst more twisting and winding roads. 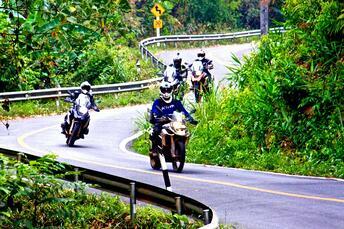 By this time in the trip, Riders may actually miss the opportunity to ride on a straight section of road! Witness the largest teak tree in the world in Ton Sak Yai National Park (estimated to be over 1,500 years old with nearly a 10m base circumference) en route to a lunch spot near the Sirikit Dam on the Nan River. 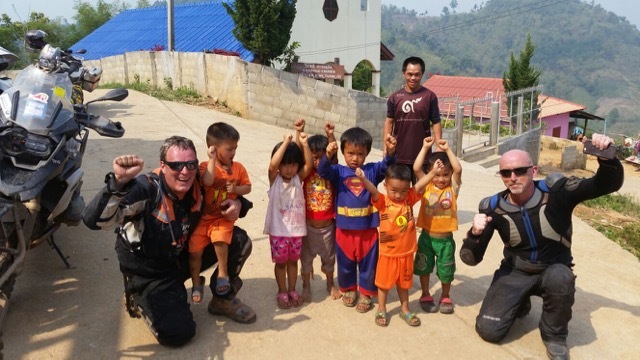 A brief ferry crossing adds even more variety to this motorcycle adventure, as more tiny villages, smiling faces and great twisting roads lead you to Nan for a little relaxation. That’s right, although some local riding amongst the mountains around Nan is possible this day, it’s a good idea to have some rest as well to remain sharp and fresh for the riding ahead. Relax, soak-up and soak-in all the sites and scenery thus far, while enjoying shopping opportunities for local crafts here in Nan. Speaking of “soaking,” did you choose our April trip date because of what we said about Songkran? If so, prepare for a day like no other in this world. Walk through a fun small city in Thailand, connecting with relaxed, fun, and warm people in this hottest month of the year. Belief is that, keeping a cool body, we keep a cool mind; therefore we remain peaceful and calm in our demeanor. Enjoy as virtually everyone in your part of the world strives to “keep you cool” in a time-honored tradition like no other! Writhing your way toward the Golden Triangle and fun town of Chiang Rai, did a few route options may exist, but we'll make sure you enjoy the best. Settle down into Thailand's northernmost city for the night, and charge up for the days ahead. With the Mekong River just in the distance, the ride heads further inland while remaining in these northernmost spaces of Thailand. With the newly paved “Paradise Road” as part of today's journey (and redefining the meaning of “sweepers") today’s ride is yet another that has Riders celebrating the fact that they ride! This celebration begins once again as both paved and dirt riding options lie ahead of you’re the front wheel on the motorcycle rental included in your package. Choosing a town like Pai gives way to “international encounters,” as the overnight plans in this fun town are an attraction to travelers from all around the world. We choose the best locations for these much-needed rest days, noting that if the itch to twist your wrist still exists, that just exploring the area around Pai will be a welcome experience. Just within this bouncing town though, there will be plenty to keep people busy with shopping, dining, and international faces. Short excursions to nearby caves and geological features are also available, but don’t forget to rest-up for the big finish ahead! 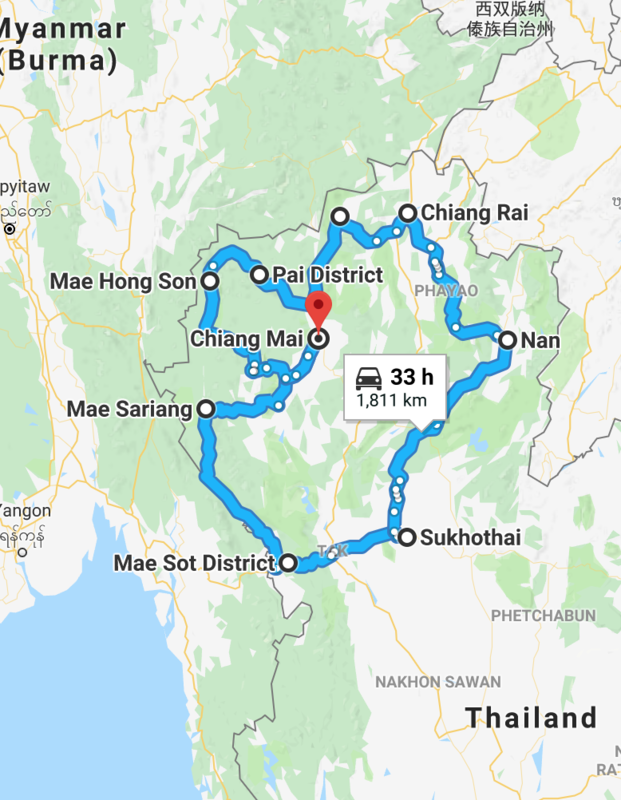 With 1864 curves spread out over the Mae Hong Son Loop, notice on some of the popular travel forums that even non-motorcycle riders recognize that this ride is one of the most exciting riding opportunities in the world. Pick your rhythm, find the apex, challenge yourself to achieve riding perfection, all while trying to focus on the path ahead instead of the surrounding scenery. --- With the end of the day bringing opportunity for a boat ride to see one of a few Longneck people’s villages out in the remote countryside, perhaps even near the end of this trip, you’re still amazed at the wide variety of experiences and joys this riding experience puts before us. Weather permitting, a wild 80km ride nicknamed “The Elephant Track” over a wide variety of mixed and challenging terrains will make an incredible start to the riding day. 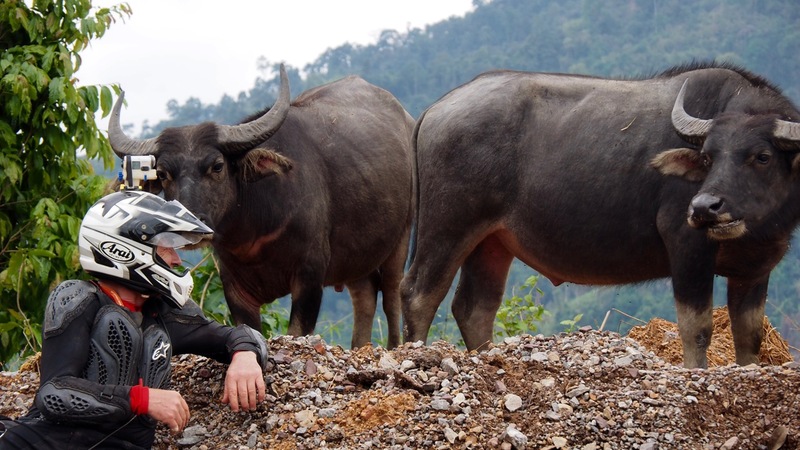 Through very remote and isolated villages in mountain settings west of Chiang Mai, not every trip itinerary can be so perfect as this one, finishing with some of the greatest scenery and what is seemingly a “composite” of all the types of riding challenges you’ve bested up to this point. Pull into the Old City of Chiang Mai once again, raise your helmet to reveal smile wrinkles like no other, and congratulate yourself for having now ridden some of the very best routes in Northern Thailand, or perhaps anywhere in the world! Stay if you can or leave if you must, but we understand if you’re already thinking about a return to Thailand or what other incredibly fun experiences can be had in Southeast Asia on 2 wheels. 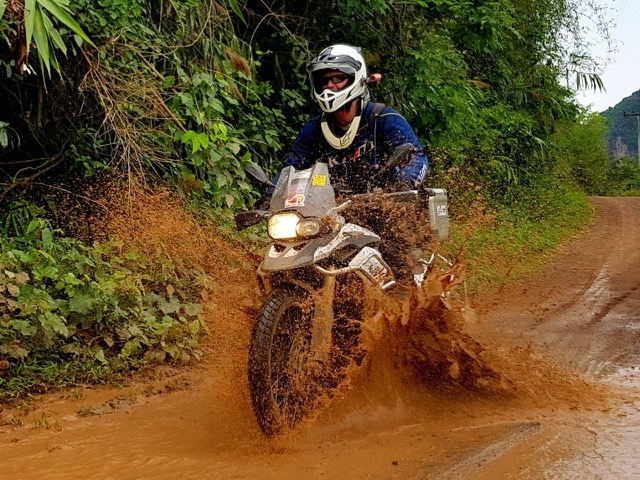 We congratulate you sincerely on a safe finish, and hope you’ll share your thoughts, photos and videos on what it was like for you, riding this Northern Thailand Experience! The new F700GS offers a larger windshield, enhanced braking system, Electronic Suspension Adjustment, Automatic Stability Control, and a handful more horsepower! As if the previous version (the F650GS) wasn't a good enough adventure bike, this mid-weight option continues to be the most versatile and popular motorcycle rental option. 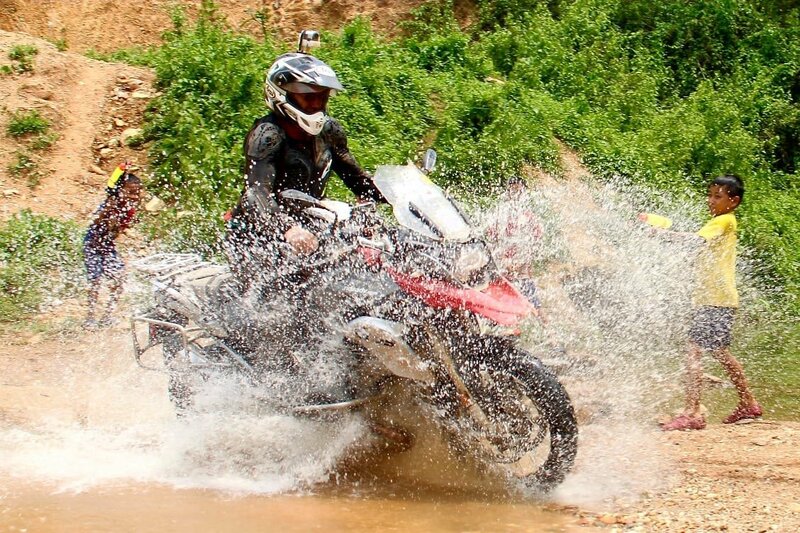 Certainly considered the “athlete” of the BMW team, the F800GS can be counted on to carry all your travel gear and still maintain the awesome feeling of a pure off-road machine when you’re in the dirt. With over 215mm of suspension travel, the F800GS boasts 85 horsepower from its twin-cylinder engine, and is sure to give an adrenaline rush when you unleash it! 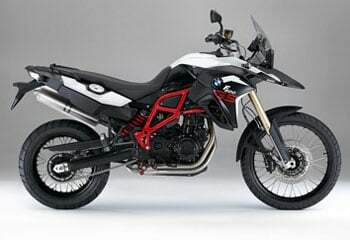 Revised back in 2013, BMW it seems has done it once again in the world of adventure motorcycles. 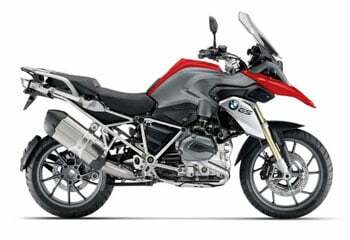 The new liquid-cooled version of the famous R1200GS comes with a more "upright" stance and off-road friendly positioning. 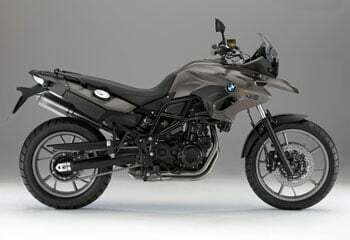 Now with a wet clutch, a higher air intake perfect for river crossings, and a 10% horsepower increase over the previous model, BMW has clearly made improvements on what was already a great adventure bike. Interested in The Thai-Laos Experience? Please Contact Us!